Mauritius Weather – what is it like to go through a tropical cyclone? 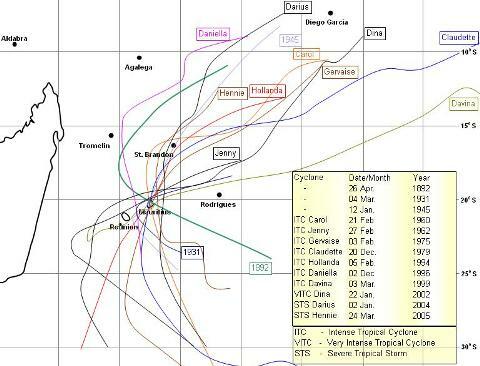 Your questions about the influences of a tropical storm on Mauritius weather answered here. . . . When do cyclones hit Mauritius? Mauritius is prone to be hit by topical storms during the summer season; between November and April. The risks are higher during the more active period, from mid-December through March, when the sea temperature gets warmer. The cyclonic season officially starts on 15 November and ends on 15 May. What happens when a cyclone is formed? Tropical cyclones mostly form on the Inter Tropical Convergence Zone, ITCZ, an area near the equator where winds from the northern hemisphere meet those from the south. Small waves on the ITCZ develop into vortexes that sometimes intensify into tropical storms. Once a cyclonic system is detected, usually around the Diego Garcia region located south of the equator and about 1,000 miles southwest of India, it is named and tracked by the local meteorological station. A cyclone watch will be issued. What are the early warning signs of an approaching tropical storm? Each hurricane is different and has its particular characteristics, but the general tendency will be a rainy and windy weather. You’ll notice a swell on the ocean surface with waves coming to the shore more rapidly. These waves race out far ahead of a storm at sea. Cumulus clouds will dot the sky and at sunset the reflection of the sunlight on these clouds will turn it reddish. The barometer will be rather steady. 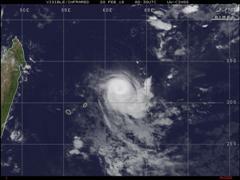 Obviously, the category, diameter and trajectory of the cyclone will influence the weather in Mauritius. The larger the size of the system and the closer it approaches Mauritius the quicker the weather will start deteriorating. It’s not uncommon to experience a bright sunny day even though a compact cyclone is roving nearby. Is there a cyclone watch to warn the population about cyclonic threats? The Meteorological Station will issue regular updates which are aired in English, French, Kreol and Hindi on radio and television as soon as the cyclone constitutes a threat. Cyclones are tracked through satellite imageries of the METEOSAT geostationary satellite and traditional weather charts analysis. The satellite imageries are updated every 6 hours. When cyclones arrive within 300 kilometers of Mauritius, more accurate data are provided by the Mauritius Weather radar located at Trou aux Cerfs, Curepipe. Additionally a visual form of warning is also used. Small red flags hoisted on public buildings indicate a prevailing cyclone warning. The number of flags corresponds to the class of warning in force. Upon termination a blue flag is hoisted. Issued 36 to 48 hours before the likelihood of gusts reaching 120 kilometers (km) per hour. At this stage there is no disruption in the daily routines of the population. Issued so as to allow, as far as practicable, 12 hours of daylight before gusts reaching 120 kilometers (km) per hour. Issued so as to allow, as far as practicable, 6 hours of daylight before gusts reaching 120 kilometers (km) per hour. When gusts of 120 kilometers (km) per hour have been recorded and expected to be recurrent a cyclone warning class IV is issued. If you are not used to raging tempests, the ferocious whistling of the winds and splashing rains – especially during a pitch dark night when the power supply is disconnected – can be quite a scary experience. Issued when gusts exceeding 120 kilometers (km) per hour are unlikely to occur. Mauritius weather conditions will gradually improve. A low-pressure system with gusts less than 89 km/h. A tropical storm in which the estimated wind gusts range from 90 to 124 km/h. Estimated wind gusts range from 125 to 165 km/h. Estimated wind gusts range from 166 to 233 km/h. Estimated wind gusts range from 234 to 299 km/h. Estimated wind gusts exceed 300 km/h. What are the precautions to be taken in the likelihood of a storm hitting Mauritius? If you are living in a hotel, you need not panic. You’ll be taken care of and regularly briefed by the hotels’ staff. In some resorts you may even expect to be pampered. note the telephone numbers of your local contact(s) and those of your neighbours if possible. Don’t hesitate to contact them in case of emergency. Bear in mind, though, you may encounter communication network failure. store sufficient amount of fresh water, canned food, bread, biscuits, cheese, fresh milk, etc. When cyclonic conditions are prevailing, stay inside and disconnect all electrical appliances. don’t get tempted to surf the high waves if you love water sports. Believe me some folks do take crazy risks to get their adrenalin going. 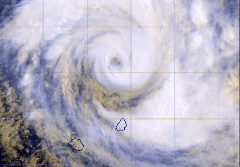 What is the “EYE” of a cyclone and what happens when it crosses Mauritius? The “EYE” is a region at the centre of a cyclone characterized by calm weather with light winds and clear skies. The rain stops abruptly. At this moment cyclonic conditions are not over. The barometer continues falling and violent winds from the opposite direction will start blowing. Do not leave your shelter when the eye of a cyclone is crossing over Mauritius. If I were to leave Mauritius on the day of a cyclone, can I still catch my flight? The airport authorities will close SSR International Airport as soon as flight safety is estimated to be compromised within the coming hours. Incoming flights will be delayed whilst in-flight aircraft will be diverted to other destinations. In all cases, as from a Class III alert the airport no longer operates and all ships would have left Port Louis harbor for the high seas. Some few hours after a Termination bulletin, all delayed flights will start converging towards Mauritius and eventually aircraft will be queued for take-off. Be prepared to experience some stressful moments at the terminals if you are leaving. Is it true that most cyclones hit Mauritius only during the weekends? Nope. 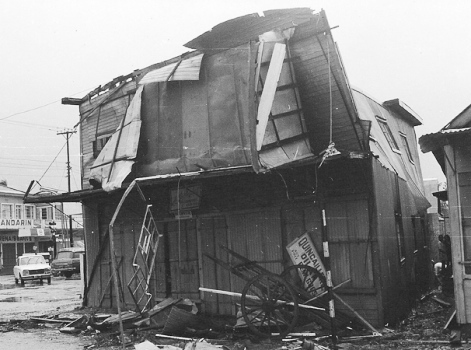 Several years back, some storms coincidentally hit the island on Saturdays and Sundays. Frustrated to see their weekend breaks ruined many Mauritians wittily commented that cyclones hit Mauritius during that period. Over the years this joke coalesced into a popular, but unfounded belief.